The Kindle version of Between Migdol and the Sea is complete! Book readers who prefer electronic viewing to print can now learn all about Crossing the Red Sea with Faith and Science on their Kindle readers. Between Migdol and the Sea: Chapter 11 Figure 1. Traditional route of the Exodus from Egypt into Canaan. Copyright 2014 by Carl Drews. I included a number of illustrations in my book, some in color and some in black and white. These figures help the reader to understand the science and geography of the Hebrew Exodus from Egypt. The problem is that the various Kindle readers have different displays. Some are high resolution (lots of pixels per inch), and some are in black-and-white. The reader can also select a huge font or a tiny font. I want readers of Between Migdol and the Sea to have a good reader experience, no matter what device they are using. Amazon provides a preview application that simulates what the book draft will look like on various Kindle models. After a lot of fiddling, I decided to set the width of images to 800 pixels and let the Kindle determine how to lay out the page based on its internal algorithms. There are various online forums discussing e-book formats, and some of the comments state that certain formats don’t even support tables. Ugh! Scientific writing sometimes requires the presentation of a group of numbers. Do you really want to read a long series of declarative sentences? No, and I don’t want to write repetitive prose either. Fortunately the Kindle models really do support tables. There is a five-column table in Chapter 7 (Following the Trail) that looks best if you rotate your device into landscape orientation. Between Migdol and the Sea: Chapter 8, formula 4. If you don’t like to read all these numbers, you can get the idea just from the plots. Formulas don’t flow and re-size as well as plain text does in an electronic book. I converted my formulas to images, and the result is satisfactory. Flames of Desire represents the archetypal romance novel. I just made up that title, but there is an actual romance novel by that name if you care to search for it. As a scientific writer I have this idea that the most difficult part of formatting and printing a romance novel is to get a good photo of Fabio and Megan Fox for the front cover. Famous models are expensive, and so are long wispy evening gowns; plus you have to put some Medieval castle into the background. Maybe they just green-screen those looming thunderclouds. But the text of the book interior is just text; it flows from page to page when the reader changes the font size or uses a larger device. There are no figures, no tables, and no formulas in Flames of Desire. The Kindle version should be easier to produce than the print version. But I could be wrong. For all you romance novelists out there, please feel free to let us know in the comments section below what challenges you encounter in preparing Flames of Desire for print and electronic readers. Tell us about your craft! Here at funmurphys we are happy to hear and learn from your different perspective. For book buyers who prefer to shop locally, Between Migdol and the Sea is now available at the Boulder Book Store on Pearl Street in Boulder, Colorado. The new movie by director Ridley Scott will be released to U.S. audiences on December 12, 2014. I am posting a humorous series of blogs that evaluate the movie with respect to science and history. To read more about Exodus, please visit Carl Drews at Google Plus. The book describes in greater detail the research about wind setdown that I published at PLoS ONE four years ago. The biblical context for Between Migdol and the Sea is Exodus 14: the narrative of Moses parting the waters of the yam suf at God’s command. The first two chapters tell what it might have been like to be present on that fateful night, with the east wind howling and the Egyptian chariot force in hot pursuit. Figure 7-3. Flying over the Kedua Gap with Google Earth. The book presents the Tanis hypothesis, which is my designation for the crossing site at the Kedua Gap in the eastern Nile delta. The Exodus occurred in the time period 1251 – 1245 BC. There were not millions of Hebrews who crossed the Red Sea, but approximately 35,750 men, women, and children in the departing company. Between Migdol and the Sea provides evidence for the historicity of the Exodus; although mythical elements have been added to the original account in later retelling, the departure from Egypt and the Red Sea crossing really happened. I provide latitude-longitude coordinates and maps so that readers can examine these places for themselves. These scientific details are woven through a story of scientific discovery; from making an embarrassing mistake during my first semester of graduate school, to finding an old map in the University of Colorado Library, to discovering Open Access publishing. The world reacted to the PLoS ONE paper with every emotion from enthusiasm to hostility. The book concludes with a chapter explaining how faith and science are compatible and should be in harmony. I hired a free-lance editor to review the text. Other friends read portions of the book and give me their comments. Technical details about the ocean model were published at the peer-reviewed scientific journal PLoS ONE in two papers. I see no need for physical laws to be suspended in order to make the waters part and leave a dry passage across the yam suf. The COAWST ocean model calculates a physical scenario that is consistent with the narrative in Exodus 14. A coastal lagoon (ancestral Lake Manzala) shifts to the west under wind stress and splits around a peninsula, leaving a temporarily dry land bridge with water on both sides of the Israelites. The miracle is in the timing; a fortuitous weather event arrives at the right moment to deliver Moses and his company from destruction. In similar fashion, the Apostle Peter knew that Jesus had directed the miraculous catch of fish (John 21:1-14), even though the law of gravity remained constant throughout the Galilee event. Of course the crossing of the Red Sea is a miracle! Printed books are complicated. Do you know what is a book’s “trim size”? Do you know what image “bleed” means? Do you know the difference between the gutter margin and the edge margins? I didn’t know these things a couple of months ago; now I do. I created the book entirely with LibreOffice, including the print layout. I wrote each chapter as a separate document, then combined them with a Master document that supplied the title pages and publisher’s page. Since Between Migdol and the Sea is a technical scientific book, I included figures, tables, citations in each chapter, and an overall Index at the back of the book. At times I wished I were writing some Flames of Desire romance novel, so I wouldn’t have all these extra elements to deal with. But LibreOffice was suitable for the task. From time to time I did Google for hints about how to accomplish certain publishing tasks that puzzled me. It’s okay to compose the text in 8.5×11 size paper, but you should create your figures in the 6×9-inch trim size from the beginning. Line drawings scale pretty well; labels do not. Same thing for tables. Try to do things the standard way that book publishers do them. Get a comparable book and examine it closely. I thought it would be easier on the reader to group my citations for each individual chapter into a compact list of References at the end of the chapter. That way each chapter reads like a complete published paper. Maybe LibreOffice can do this, but I could not figure it out. So I ended up with a single multi-page Bibliography containing all my references at the end of the book before the Index, just like everybody else does it. Although I value what literary agents and book publishers can contribute to the publication process, for reasons of timing I chose the Independent Publishing route. I selected Amazon’s CreateSpace as my self-publishing platform for Between Migdol and the Sea. CreateSpace worked out well for me. The basic approach is to create one PDF to represent the entire book interior in black-and white, and a second PDF to represent the book cover in color. CreateSpace must handle a lot of indie authors, because they have a well-polished web site and an extensive user community. I answered a few of my questions by poking around in the user forum. The CreateSpace web tools reminded me of PLoS ONE; there always seemed to be a check box or option or help message to get you what you need. This is unlike the traditional scientific journals, who leave it up to the author to figure out how to generate a tiff image file. CreateSpace has templates for the book size and cover, and an automated reviewing tool to look over your interior PDF before printing the first proof. After some fiddling and multiple uploads, my manuscript started to look like a real book! I am still working to prepare the Kindle version. A traditional publisher makes a “print run” of several thousand books and then offers them for sale through various outlets (mail order, bookstores). I’ll make up some numbers here for illustration: let’s say that each book in the print run costs the publisher $5. The initial setup costs for a print run are high, but the marginal cost of each book is low, so they have to print thousands of books to keep the cost per unit down. If the book costs $20 list price, then everyone in the chain can make some money, including the author. The problem with a print run is inventory. The publisher may have thousands of printed books in storage until they (hopefully) sell. Bookstores have to keep books in stock. If the author and publisher want to release a new edition, they have to wait until all the unsold inventory is cleared out of the pipeline. Inventory can pose a problem. Print On Demand (POD) is an online printing technology whereby each individual book is printed when an order is received. When the online reader (that’s you) clicks the Purchase button, some electronic printer in some light manufacturing facility downloads the cover PDF and interior PDF, prints them out, automatically folds the cover around the pages, glues them together, and cuts them off to the trim size – Ka-Chunk! Then the completed book slides down a chute along with the mailing label. Some human being wraps the book and ships it, or maybe the packaging is automated, too. Let’s say that each Printed On Demand book costs the publisher $10 to manufacture. (I don’t think POD can be as cheap as a multi-thousand-book print run, but maybe someday.) The book has to have a list price near $20 to compete with the traditional publishing method. There appears to be less money for everyone in the POD publishing chain, but there are no expensive warehouses full of expensive inventory any more. That’s how Print On Demand can compete with traditional print runs. Furthermore, CreateSpace can afford to take a chance on unknown first-time independent authors like me, because they don’t have to risk getting stuck with thousands of unsold books. And that is why Indie Publishing has gained some traction in the book publishing industry. Figure 11. December 2006: Wind setdown and storm surge, with experiments E4, E18, E21, and E23. From Drews (2013). In Figure 11, the black line represents the observations of water level taken at the Fermi power plant at the western end of the lake, and at Buffalo at the eastern end of the lake. The colored lines represent various model runs. The goal here is to get the colored lines to match the black line as closely as possible. This is done by adjusting the COAWST model parameters in a sensible manner. Adjustments include: the numerical formula for the air-sea drag coefficient, the bottom drag coefficient, the influence of waves, and the algorithm used to simulate wave action, and the presence of ice on the lake. Why Lake Erie? Lake Erie happens to be a near-perfect natural laboratory for conducting this kind of experiment. The lake is long, shallow, and subject to strong winds from the west that cause the lake water to slosh back and forth like a big bathtub. Since the lake is surrounded by populated areas in the United States and Canada, there are many weather stations along the coastline that provide archived meteorological data. Lake Erie is also an important seaway for international commerce, and NOAA provides accurate measurements of tides and currents at major ports on the lake. I can run simulation experiments with confidence in the observations that I am trying to match. The paper describes two windstorms on Lake Erie: December 1–2, 2006 and January 30–31, 2008. Lake Erie is 400 km long and 90 km wide. Since I don’t have a gigantic fan big enough to blow the lake water around and measure what happens, I have to wait for nature to do the blowing instead. Fortunately for me, these windstorms occur often enough to provide several usable data sets. Better yet, there were no human fatalities in either of these storms. The potential result of the research is a more accurate model for storm surge. When building coastal defenses such as floodwalls, it is crucial to know how high the ocean will rise when the next hurricane comes ashore. The difference between building a seawall one foot higher than the maximum surge, and one foot lower than the maximum surge, can be disastrous. That earlier paper reported the emergence of a land bridge in the eastern Nile delta under certain conditions of wind speed and direction. For readers of funmurphys who are interested in Moses crossing the Red Sea, the ocean model indicated that Moses would have 4 hours to lead the Israelites across the yam suf. At the time, I suspected that the estimate of 4.0 hours was somewhat conservative; that is, the dry passage probably would have stayed open for a longer period of time. There were several factors that we did not include in the 2010 research, such as waves and a drag coefficient more suited to coastal conditions. I had a hunch that these additional factors would increase the duration of the passage. However, the rigorous nature of scientific publishing requires that scientists cannot publish more than a few paragraphs of speculation; peer-reviewed journals require concrete results supported by evidence from observations and computer models. The Lake Erie research provided a chance for me to test my earlier hunch. I was pleased to find that my hunch was correct; but better yet, that I could provide a revised number for the crossing time. Here it is: Moses had over 8 hours to evacuate all the Israelites from Pi-Hahiroth to safety at Tell Kedua on the other side of the yam suf. Or, for scholars who are more interested in the wind speed, an east wind blowing at 24 meters per second is sufficient to hold open the dry passage for 4 hours (the 2010 paper reported 28 m/s). Figure 13. Corrections applied to the Lake of Tanis and the Kedua Gap. From Drews (2013). I like this result, because it shows that there is some engineering tolerance to the solution. Although God can of course do anything He wants to do, as an engineer I am happier with a answer in which the parameters can vary a bit and still work. The 2013 paper demonstrates that the Kedua Gap is a more robust reconstruction of Exodus 14 than originally thought. Researchers use new technology to search for the truth behind the stories in the Bible. This article gave several examples of scientific research that supports certain biblical accounts. Newsmax reporter Jack Penman led off by describing my research about Moses and the Israelites crossing the Red Sea. I published a paper in the peer-reviewed journal PLoS ONE describing the meteorological phenomenon of wind setdown occurring at a place called the Kedua Gap in the eastern Nile delta. A strong wind blowing overnight can indeed cause the waters of the yam suf to recede and divide. The article cites the resuscitation of a woman declared medically dead. To me, this example does not match the details of the story recorded in John 11. Nevertheless, we Christians are supposed to follow Jesus’ example, and if we can prevent premature death by medical means, that’s all to the good! The article mentions a hypothesis that the two sinful cities were destroyed by an asteroid, and the event was recorded on a Sumerian clay tablet. You can read more at this article, or search for these keywords: Sodom Gomorrah asteroid Sumerian astronomer Alan Bond Mark Hempsell Köfels. Colin Humphreys suggested in his book “The Miracles of Exodus” (2004) that the burning bush was above a volcanic fissure emitting hot gases. The article cites William Ryan and Walter Pittman and the Black Sea Flood as being the probable source of the Flood story in Genesis and the Gilgamesh Epic. Every biblical event occurred exactly as some fundamentalists interpret the King James Version of the Bible. The Old Testament contains no valid history prior to the Babylonian exile; it was fabricated by Hellenic Jews to create a fictional glorious history. With regard to extreme position 1, Ryan and Pittman understand the Flood to be a local flood, not a global one. The Black Sea flood was a traumatic event for the people of the time, and they carried those memories forward in their oral history. There is no young-earth Flood Geology here. Extreme position 2 is rejected by the findings of science. Not only are the biblical narratives scientifically plausible and difficult for ancient bards to fabricate, but research confirms important details of the stories. The plagues follow a natural chain of environmental events; the author of Exodus is not merely stepping through the Egyptian pantheon. Reporter Jack Penman concludes: “maybe science and religion can better coexist.” Amen to that! Senator Inhofe’s comments were in reference to his recently published book: The Greatest Hoax: How the Global Warming Conspiracy Threatens Your Future. What we have here is a politician using the Bible to make a political point. Unfortunately, Senator Inhofe is wrong. He claims that since God controls the earth’s climate, we human beings cannot possibly change the climate, and it’s arrogance to think that we can. But Genesis 8:22 does not say that. God’s covenant here refers to what God has promised to do, not what mankind can do. God will not send another Flood that destroys civilization. Verse 22 is not a guarantee that God will preserve the earth from the consequences of man’s poor stewardship. seedtime and harvest: There will always be seasons. cold and heat: There will always be variation in temperature. summer and winter: There will always be seasons. day and night: The earth will continue to rotate. No climate scientist anywhere is suggesting that seasons will cease. This is a straw-man argument by Senator Inhofe. No climate scientist anywhere is suggesting that temperature variation will cease. Scientists are suggesting that there will be more heat and less cold. Genesis 8:22 does not contradict that. God’s command in Genesis 1:28 to “subdue the earth” is meaningless if mankind cannot possibly accomplish this. But God does not give meaningless commands. According to the Bible, we are capable of changing what’s going on here. Our actions have effects and consequences. The tenants don’t own the vineyard. The vineyard is not for their benefit! The Master owns the vineyard. “The earth is the Lord’s and the fullness thereof, the world and those who dwell therein,” (Psalm 24:1, ESV) We really can mess up the earth through poor and sinful stewardship, and if we do, we really won’t like what happens when the Master returns. Genesis 8:22 does not point to climate science. Genesis 8:22 points to Jesus Christ. On December 13, 2011, I appeared in a TV documentary titled “Proving God” shown on the History Channel. My section of the program described how scientists investigate the narrative of Moses parting the “Red Sea” in Exodus 14. Sir Colin Humphreys and I explained how the meteorological phenomenon of wind setdown matches the Biblical account. I am providing here a transcript of what I said on the program; since this blog represents Fair Use in a scholarly setting, I can only provide a limited section of the text. Figure 1. Reconstruction of the Nile delta by James Rennell, based on the writings of Herodotus. The black rectangle shows the site of Drews and Han's proposed crossing site at the Kedua Gap (30.9812 North, 32.4553 East). This is Figure 2 of Drews Carl, Han Weiqing, 2010 Dynamics of Wind Setdown at Suez and the Eastern Nile Delta. PLoS ONE 5(8): e12481. doi:10.1371/journal.pone.0012481. Narrator: Atmospheric scientist Carl Drews of the National Center for Atmospheric Research believes Humphreys may be onto something. Carl Drews: Wind setdown occurs when a strong wind blows over a period of time across a surface of water; and gradually the water moves in the direction of the wind, and pulls away from the shoreline, and so the surface of the ocean moves down. So what you have there is a section of dry land where there was formerly sea bed. Narrator: Accessing the power of supercomputers, Drews has studied the effect of wind setdown in locations ranging from the Nile, and coastal England, to a pair of such episodes in the Great Lakes in 2006 and 2008. Carl Drews: Wind setdown is observed about every 5-10 years on Lake Erie. You have these strong storms that come from the west, and they cause storm surge at Buffalo; but on the Toledo side, which is the upwind side, the large sections of the lake will be completely dry. The water will have disappeared over the horizon! Colin Humphreys: It’s been observed that the difference in height between one end of Lake Erie and the other can be as high as 16 feet. Absolutely staggering, right? You’d expect Lake Erie to be level water, but in a strong wind, blowing for many hours – 16 feet difference! Narrator: Harnessing data gathered from NASA satellites, Carl Drews creates an ocean model and terrain map of the Gulf [of Tineh], to examine the possible effects of such a storm. Carl Drews: I used geological maps, geological surveys, and sediment cores to reconstruct the configuration of lagoons and rivers that were [present] during the Exodus period. Then I ran this on the ocean model with a supercomputer and applied a digital wind to this, a wind blowing at 63 miles per hour. It would be difficult to walk into that kind of wind, but it’s possible. You can make forward progress. Narrator: Combining the Biblical account of the crossing with the scientific modeling, Drews constructs a timeline that matches the conditions described in Exodus: the perfect storm. Carl Drews: The Bible says that this occurred over a night, so – wind blowing for 12 hours suddenly stops, and I find that the waters part, and stay parted for a period of 4 hours. Then they rush back together again. Narrator: But even given 4 hours to cross the exposed land bridge, it would have been impossible for 2 million Israelites to traverse the Red Sea and escape. Does the scientific evidence disprove the Bible account? Carl Drews: That would be a lot of people to get through a small space in just 4 hours. Colin Humphreys: This number is unbelievably large! A lot of people think the Exodus story is made up. Narrator: If Humphreys’ new calculation is accurate, it bolsters the case that the Red Sea miracle really did happen. Narrator: From cosmology, and archaeology, to oceanography, researchers from a variety of scientific disciplines have launched a global search to discover quantifiable proof of God. Sir Colin Humphreys and Carl Drews are looking for evidence that will prove that the events described in the Bible actually occurred. Using precise calculations, along with complex computer modeling, each man has detailed a perfect storm scenario which they claim could have caused the parting of the Red Sea, just as described in the book of Exodus. Figure 3. Tidal bore on the Qiantang river, Hangzhou, China. This image is from Wikimedia Commons at http://commons.wikimedia.org/wiki/File:Tidal_bore_at_the_Qiantang_river,_Hangzhou.jpg. According to their theory, a phenomenon known as wind setdown caused winds of rare duration and force to peel back the waters long enough for the Israelites to make their way to freedom across an exposed land bridge. But the book of Exodus also describes the sudden destruction of the Pharaoh’s army as they chased the Israelites across the sea bed. To explain this, Drews and Humphreys point to the opposing natural force that can follow extreme cases of wind setdown. A bore wave. The term defines the phenomenon where a tide returns displaced water with such force that it forms a giant wave of enormous power. Carl Drews: When the wind stops, suddenly that water comes back again, and you would get these walls of churning water, thundering in! and crushing anybody who is left in the passage there. Narrator: Drews’ calculations reveal that a wind setdown powerful enough to part the Red Sea would have unleashed a bore wave of staggering magnitude. Narrator: Whether invoked by the hand of Moses, or the natural reaction to wind setdown, a bore wave of this force would have obliterated the Pharaoh’s army in an instant. Carl Drews: Suddenly they hear this roaring in the distance! Then they look up, and what looks like a mountain of water is bearing down on them from both sides, and from the back. Colin Humphreys: It sweeps these people back into the sea, which is precisely what the book of Exodus says. So even this little detail in the Exodus fits what we know from modern science. Narrator: But while these natural phenomena offer a scientific explanation for the events described in Exodus, that alone does not prove God. Carl Drews: It could be that Moses got very, very, very lucky. It could be that he was a very, very good weather forecaster. Colin Humphreys: So you may say, Why do we call this a miracle? The reason is because of the timing. They would have been slaughtered! Colin Humphreys: So I think it’s the timing that shows the hand of God at work. Narrator: Both Drews and Humphreys agree that the evidence of God is not in the natural events themselves, but rather in their miraculous timing. Ultimately, it is beyond the powers of science to explain how a once-in-a-lifetime storm occurred at the exact place and time to rescue the Israelites. Narrator: While their work has narrowed the divide between science and the Divine, these scientists admit that, for the moment, faith is needed to span the last gaps. Carl Drews: The scientist should be humble and realize when their science cannot go into the supernatural. We only study the natural. So I study the movement of the wind and the water. According to the Bible, God sent the wind at the right time and told Moses to be there. Dynamics of Wind Setdown at Suez and the Eastern Nile Delta, by Carl Drews and Weiqing Han, August 30, 2010. Boulder scientist’s research affirms parting of the Red Sea, December 15, 2010. Could Wind Have Parted the Red Sea? January/February 2011. “Proving God” was produced by Karga Seven Pictures for History. A remarkable thing about this particular book is that it contains a hand-written dedication on the inner page by Hellstrom himself. “Professor A.E. Bretting, with best wishes for Christmas and the coming year, from Bo Hellstrom”. He touched the same page that I am touching! I like that. The study of physical laws underlying the parting of the Red Sea has a long history. The Jewish historian Flavius Josephus in 94 AD urged people not to wonder if the strange narration in Exodus 14 “happened of its own accord”. But as any parent knows, as soon as you tell kids not to do something, they go ahead and do it! Generations of scientists have ignored Josephus’ advice, preferring to follow Psalm 111:2 instead. Samuel Bartlett in 1879 suggested that Moses might have taken advantage of wind-lowered water levels, crossing on a shallow ford southeast of modern Suez. Sir Alexander Tulloch actually observed a wind setdown event on Lake Manzala, which led him to conclude in 1896 that the famous passage took place between the Great Bitter Lake and Lake Timsah. Professor Hellstrom brought the science of hydraulics to bear on the Exodus problem in 1924. In his lab he constructed a wind tunnel over a trough containing water, roughly modeling the topography of the northern reaches of the Gulf of Suez. He used an underwater sill to provide a dry crossing with water on both sides at Serapeum, the same site suggested by Tulloch. His book shows maps and detailed diagrams and photos of the water-level gauges that he built on the side of his wave tank to measure the water surface accurately. Bo Hellstrom was quite the experimentalist! His diagrams look a lot like mine. So I have this fascinating book in my hands, and I would like to share Hellström’s scholarship with the rest of the world. As Dr. Frank J. Little, Jr. has stated, “Our purpose is to return Hellstrom’s Exodus hypothesis to the scientific community, plus quantify and update it in light of newly synthesized evidence.” How can I do that? Bartlett’s book is available through Google Books, and anyone can read it on-line. I had to get Hellstrom’s book through an Interlibrary Loan with California State University at Fresno. That’s a big difference in terms of ease of access! People will find and read Samuel Bartlett quicker and more often than Bo Hellstrom. Samuel Bartlett died in 1898. His work is now in the public domain, and this is why Google can legally digitize his book and make it available on-line. Bo Manne Hellstrom died in 1967. Sweden has a copyright term of 70 years after the author’s death, so his copyright will not expire until the fair year 2037. And until then, “The Israelites’ Crossing of the Red Sea” will languish in Interlibrary Loan Land. Ick. If Hellstrom’s book suddenly became an overnight sensation, and if scads of people were clamoring for it and paying thousands of dollars to obtain one of the rare copies, then the Royal Institute of Technology in Stockholm would take notice and starting printing a new edition of the book. They would make lots of money and send royalties to Hellstrom’s heirs, wherever they are now. That’s why copyrights endure long after an author’s death, and the system works well for people like Mark Twain and Walt Disney. Unfortunately, the copyright system is not serving B. Hellström very well. His book contains scholarly and historical interest, but with all due respect, “The Israelites’ Crossing of the Red Sea” will never be a best-seller like “Huckleberry Finn”. Nor does anyone expect that – scholars are valued for their intellectual contributions, not necessarily for their popularity with the general public. Bo Hellstrom’s work will remain locked up for another 26 years where only a few determined scholars will read it; unlike his predecessor Bartlett, who can be read by any high school student who enters the right search string into Google. Professor Hellstrom would have benefited from Open Access. It would have increased his scholarly impact. We would still be reading his work and he would get all the credit. Too bad the Open Access movement came too late for him. Special thanks to Professor Ian Larsen of the Royal Institute of Technology in Stockholm for supplying additional information on Bo Hellström. Larsen adds, “A E Bretting was professor in Hydraulic Engineering in Copenhagen and retired around 1958.” I would love to know how Hellstrom’s book made its way from Copenhagen to Cal State Fresno, but I have enough historical mysteries for one lifetime already! Bartlett, Samuel Colcord, 1879. From Egypt to Palestine: through Sinai, the wilderness and the south country. Harper, New York, New York, USA. Hellström, Bo, 1950. The Israelites’ Crossing of the Red Sea. The Institution of Hydraulics, The Royal Institute of Technology, Stockholm, Sweden. First published in the Swedish language in 1924. Larsen, Ian, 2003. A La Recherce du Temps Perdu: The times of J Gust Richert and thereafter. Zentech Belgium, Brussels, Belgium. Tulloch, Alexander Bruce, 1896. Passage of the Red Sea by the Israelites. Journal of the Transactions of the Victoria Institute (now Faith and Thought) 28, 267-280. The Victoria Institute, London, United Kingdom. News sources are quoting a figure of 1.5 million cubic feet per second for the current flow of the Mississippi River at the Morganza spillway. That is a lot of water! To get a visceral idea of how much water that is, my brother Mike from Sandy, Utah sent me some calculations describing how the flow at Morganza (above Baton Rouge) compares to the flow of the Colorado River. 1.5 million cfs is equal to 34.43526 acre feet / second. By comparison, the total capacity of Lake Powell is 24,322,000 acre feet; currently 53.99% full, available capacity 11,205,145 acre feet. The Upper Colorado Basin is supposed to provide an average of 7.5 million acre feet each year past Lees Ferry, Arizona. On Wednesday (May 11, 2011) the flow into Lake Powell was 31,862 cfs, and outflow was 14,791 cfs. Little Cottonwood Creek flood stage is around 500 cfs (coming down into Sandy from Alta and Snowbird). Lake Powell capacity and percent full numbers are taken from http://lakepowell.water-data.com/. Lake Mead capacity and percent full numbers are taken from from http://lakemead.water-data.com/. So at 1.5 million cfs, the Mississippi would deliver the annual flow past Lees Ferry in 2.52 days, would fill the currently available storage in Lake Powell in 3.77 days, and would then fill the available capacity in Lake Mead in another 4.96 days. That’s a lot of water! If I could somehow capture and store 1 second of the current Mississippi flow, I could easily water my yard for the rest of my life. And they would never miss it! That link is an old article by John McPhee about attempts to control nature, which is probably getting a lot of web traffic these days. If the Old River Control Structure were to fail, most of the flow of the Mississippi would flow down the Atchafalaya River, taking a much shorter route to the sea and leaving New Orleans and Baton Rouge along a backwater channel. The interesting thing to Mike is that in the long term, the Mississippi Delta is eroding and subsiding while most of the sediment is funneled into deeper waters in the Gulf of Mexico. He further observes that to prevent the loss of the Delta and associated flooding from the ocean (especially during hurricanes), they should allow flooding from the Mississippi River to deposit sediment (mud) on the land, and probably need to let the Mississippi River take new channels to the Gulf every few hundred years. And he’s right. That long lobe of the Mississippi delta past New Orleans is called a “bird’s-foot delta” because it looks like one. It’s unnatural for a delta to form like that, and it’s a consequence of 100 years of levees upriver and in the delta itself. He’s right – all the sediment is going to exactly the wrong place. There is a way to fix this. We need clean water to flow down the Mississippi to New Orleans (thereby eroding and deepening the built-up channel), and muddy water to pass down the Atchafalaya (thereby building up that lower-elevation lobe). How can we separate the muddy water from the clean water? Build a sediment trap! The Army Corps of Engineers needs to create a small lake at the point of the diversion. When muddy water flows into a lake, the mud settles to the bottom as sediment. Clear water flows beyond that inflow delta, and eventually flows out of the lake. This is why Lake Powell is getting filled up with sediment in its upper reaches, and why the Grand Canyon is sediment-starved. The lake should have two major outflow pipes: one positioned at the lake bottom close to the inflow, and the second positioned near the lake surface at the downstream end of the lake. The “bottom near the inflow” pipe feeds sediment-laden water down the Atchafalaya river. The “surface downstream” pipe feeds clear water down the Mississippi. After decades, and some big floods like the current one, the Atchafalaya lobe will build up and the New Orleans bird’s-foot will erode away. The Morganza spillway already has a stilling basin, but that’s designed to dissipate energy, not separate out the sediment. Yes, it will cost a lot of money to build the sediment trap, but the alternatives are a lot more expensive. What is the cost of relocating New Orleans and Baton Rouge? We are hoping to accomplish here a controlled stream capture and relocation of the sediment load. By the way, the natural event when a river distributary carves a new channel is called a “crevasse event.” The river catastrophically breaks through the natural levee and forms a crevasse where the new channel pours out. A lot of people in the John McPhee article were terrified of a crevasse event happening on its own. We need a sediment trap and decades of patience to let it work. 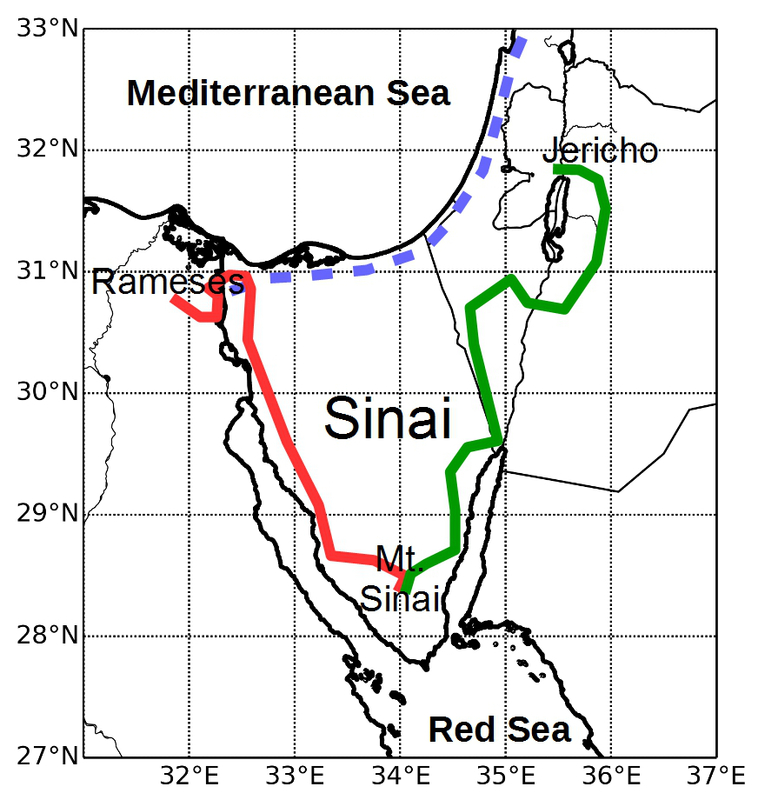 On August 30, 2010 I published a scientific paper in the peer-reviewed journal PLoS ONE entitled “Dynamics of Wind Setdown at Suez and the Eastern Nile Delta”. This post is a follow-up to my earlier post of August 31, which focused on Open Access. So – what happened? Plenty! My employer issued a press release on September 21, 2010, which is our standard practice for research that we think will have popular interest. There was extensive media coverage during that week, including segments by ABC News, Fox 31 KDVR in Denver, National Public Radio, CNN.com, and the BBC. After working hard on this research for years as a graduate student, it was gratifying to receive the attention! The number of article views at PLoS ONE is now at 39,009. Our animation of Parting the Waters has been viewed 542,928 times on YouTube, and my verbal explanation there has been viewed 58,618 times. What role did Open Access play in the publication of my research results? 1. Open Access is ideally suited to inter-disciplinary topics of popular interest. Many scientific journals focus on a single area of science, and reject manuscripts that are judged to fall outside that discipline. Is my research: oceanography, meteorology, archaeology, history, coastal oceanography, biblical studies, numerical modeling, geology, or what? A limited access journal tends to exclude from its readership those scientists who do not subscribe to the journal, placing a barrier to experts outside the journal’s focus. That same barrier to readership also discourages interested amateurs who are willing to brave the paper’s scientific rigor and try to understand what it’s about. I recognized that the Exodus problem is highly inter-disciplinary, and this publication might spark great popular interest. I didn’t want to exclude anyone from reading the paper, even with a small download fee. 2. Open Access increases the number of article views. PLoS ONE includes a number of useful metrics, including the number of article views. As noted in my previous post, I want lots of people to read my paper. Although I don’t have extensive metrics on article views between Open Access and limited access, my colleagues tell me that 39,009 views is a lot for a scientific paper! We think it would be hard to get those numbers with limited access. Unfortunately, I cannot re-run this publication experiment with a traditional journal and count up the views again. Cumulative and daily article views. Obviously the press release and subsequent media coverage had a huge effect on article readership. Over two weeks the number of article views zoomed up from 500 to over 35,000! Since the graph doesn’t shoot up until the press release, people must be reading the news first and then looking up my scientific paper. It is safe to say that the media coverage caused a jump in article views, not the other way around. Media coverage drives people to my research; Open Access lets them in the front door. 35,000 people became interested enough to look at the original paper, and indeed they could (with some repeat visitors). Open Access works together with media publicity to increase drastically the societal impact of scientific research. 3. Open Access assists helpful amateurs to educate the general public. In comments and blog posts I have noticed about 1 in every 20 posts is from a knowledgeable person who is trying to educate the rest of the folks on the forum. Often they have posted a link to the original paper, with the remark that it’s open access. These knowledgeable people are “amateurs”; and I use that term in the sense that they love science! They take time to educate themselves, they read technical articles, and they provide helpful references for everyone else. They look up facts instead of just typing in something and hitting the Post button. They verify the details and correct mistaken assumptions. Helpful amateurs are very important in communicating science. Professional scientists cannot do it alone. I can make the amateurs’ job easier by providing open access to my scientific publications. I appreciate their valuable efforts. Open Access increases my impact as a scholar. Scientific research is hard work! The societal impact makes it all worthwhile. On a related note, I have just published an article in Weatherwise magazine as a follow-up to the earlier scientific paper. This magazine article “Could Wind Have Parted the Red Sea?” explains the parting of the sea to the general public. So if you don’t want to read about drag coefficients and Mellor-Yamada mixing, that’s where to go! The views expressed here are not necessarily those of my employer. UCAR has adopted an Open Access Policy, and has implemented that policy by the creation of an institutional repository of scholarly works known as OpenSky. Wind setdown is the drop in water level caused by wind stress acting on the surface of a body of water for an extended period of time. As the wind blows, water recedes from the upwind shore and exposes terrain that was formerly underwater. Previous researchers have suggested wind setdown as a possible hydrodynamic explanation for Moses crossing the Red Sea, as described in Exodus 14. Since the paper is about dynamics instead of biblical history, the contents focus on fluid mechanics instead of on Moses and the Hebrew refugees. But for those readers who are interested in the Exodus, Point B in Figure 8 is Pi-hahiroth. The famous crossing is from Point B across to Tell Kedua. My Tanis hypothesis suggests where and how Moses crossed the yam suf. When remains a thorny issue. As with any new hypothesis, scholars from many disciplines will have to consider the proposal from all angles (history, linguistics, military science, archaeology, meteorology, refugee movement, sociology, oceanography, etc.). PLoS ONE is an Open Access journal, meaning in a general sense that access to the publications is not restricted. You don’t have to pay a download fee or a subscription fee to download and read the articles. It’s free Free FREE! For what Open Access means for the world of science at large, Google for the term and do some reading. Go ahead and peruse some of the debates. I’ll describe here what it means for me. It means that my co-author and I paid a publication fee to cover the cost of reviewing and preparing the document for on-line publication. Some journals (Open Access or not) are free to publish in, and others require certain page charges. PLoS ONE follows the “author pays” model. The “Dynamics of Wind Setdown” article is of general interest. I want oceanographers to read it, I want journalists to read it, I want high school students to read it. I want teachers, gardeners, Norwegians, mechanics, historians, kids, pastors, marketing directors, software engineers, physicists, Australians, poor people, airline pilots, retired people, shepherds, and checkout clerks to read it. I want you to read about the parting of the Red Sea. Skip right to Figure 8 if you want! I don’t want any barriers to readership. I want the paper’s exposure to be as wide as possible. And I can achieve that goal by opening up access. Peer-reviewed articles are read by scholars, who cite previous research when they publish a subsequent study. The citation count is a measure of the impact of a paper – the importance that a paper has on its field. Open Access papers are supposed to have higher citation counts, so this publishing model will presumably be better for my career. Open Access means that you can make use of the material that we published. The content at PLoS ONE is licensed under a Creative Commons Attribution License. This means that you can use the article in ways described by the license, so long as you properly cite the authors and the journal. The idea behind the CCA license is that scholars’ work should be used and extended, with due credit given to the original publication. You don’t have to get our written permission. Please refer to the Creative Commons web site for further information. Open Access means that you don’t have to pay $30 or even $15 to download the paper and read it. Your institution or library doesn’t have to pay thousands of dollar$ in subscription fees to get the document. You just have to click. That’s right, you simply have to click on this link. What are you waiting for? Click! Download and read it now!